The significant growth in online shopping sales, and the impact it is having on bricks and mortar retailers, has been well documented. Given the strong proportionate gains in the former, compared with the nominal sales growth being achieved by shopfront retailers, it would appear that the acceleration in online buying is still gaining momentum. 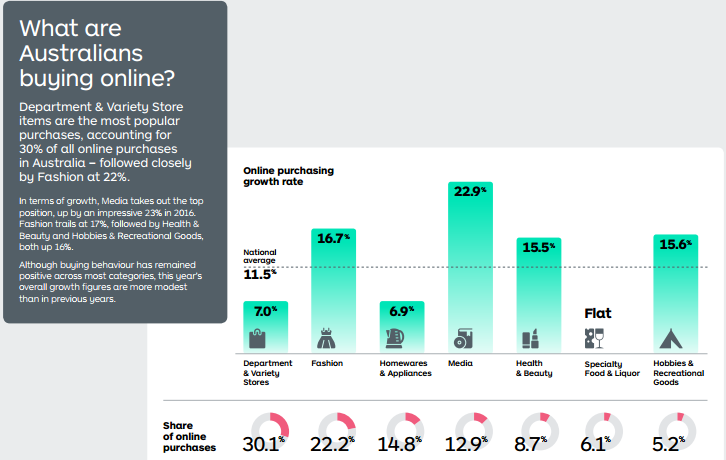 The following data released by Inside Australian Online Shopping, an Australia Post publication, highlights the growth that occurred in 2016 and the product segments that tend to lend themselves to online buying. On the equities front, plenty of market commentators and analysts are telling investors to dump bricks and mortar retailers and buy the small clutch of ASX listed online retailers, but this doesn’t throw up many options. Of course, success of ASX listed online retailers is not guaranteed — consider your own personal circumstances before investing, and seek professional financial advice. 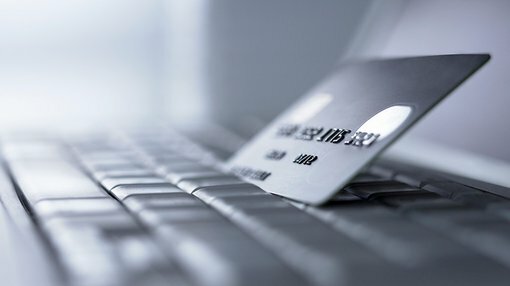 Many of the smaller players in the online retailing sector are unproven new entrants – representing a significant risk. While the success of a company such as Webjet Limited (ASX:WEB) makes it look all too easy, it pays to keep one of the more prominent failures such as Wotif in mind. While there were a mix of factors that led to Wotif.com Holdings Ltd’s demise, some of the key issues were its inability to effectively integrate acquisitions and an underinvestment in new technology required to support increasing traffic and consumer demand for high-quality information. Given many of the new players are reliant on a growth by acquisition strategy, but are not yet financially robust enough to tap the market for the potential capital, their ability to negotiate in an increasingly competitive environment needs to be questioned. Of course, there are also the tech plays that supposedly have game-breaking technologies that assists companies in optimising their e-commerce operations. However, today’s best of breed technology can quickly be superseded. This suggests that investors, particularly those with a low tolerance for risk who are looking for defensive options, need to find companies with earnings predictability and an understandable business model. The other issue is valuation as e-commerce companies traditionally trade on inflated multiples. Some examples of ASX listed companies trading on high PE multiples, relative to consensus fiscal 2018 forecasts, are REA Group (ASX:REA) at 32.5x, Carsales.com (ASX:CAR) at 24x, and Webjet at 19x. Investors used to have some options in terms of ASX listed businesses that generated tangible earnings from the transport and delivery of a wide range of goods. One of the key players was Toll Holdings, but just as momentum shifted in favour of e-commerce related goods delivery, the company was taken over by Japan Post, which as things panned out, paid way too much, resulting in a $4.7 billion write-down. While that is a story in its own right, it is an indication of the merger and acquisition activity that could result in a revaluation of similar industry players, particularly as the sector heats up. While CTI Logistics (ASX:CLX) is a much smaller player than the likes of Toll Holdings, it is a much cleaner and more focused business as a provider of couriers, parcels, taxi tracks, fleet management and regional freight services. CLX has been a listed public company since 1987 with its transport and logistics origins dating back to 1972. The company has more than 700 vehicles ranging from courier vehicles to triple road train combinations. Management has made astute decisions in expanding its infrastructure to handle increasing volumes. With this investment now largely absorbed the company stands to reap the benefits. CLX currently has a 54,000 square metre warehousing facility and 95,000 square metres of undeveloped land available for future expansion. Acquiring the site and developing the infrastructure required substantial investment, placing a drag on earnings back in 2014/2015. The company also relocated its GMK Logistics business to a new purpose-built facility, nearly doubling its Sydney storage capacity from 9000 square metres to 16,000 square metres. CLX delivered an impressive fiscal 2017 result which featured cash flow of $17.6 million, up from $9.9 million in 2016. This assisted the company in reducing debt, and its balance sheet has the capacity to fund further expansionary measures. While revenues from operations were up by a nominal 2.5 per cent to $154.4 million, reported profit before tax for the year was $7.8 million, including the profit on the sale of the Malaga properties of circa $2.9 million. There was also a nominal increase in the deferred contingent payment of approximately $300,000 related to the GMK Logistics acquisition. The profit before tax, excluding these adjustments, was $5.2 million — a 20 per cent increase on the previous corresponding period. The reported net profit after tax was approximately $6 million, representing earnings per share of 8.8 cents. This implies a PE multiple of approximately 11 based on the company’s share price of 96 cents. Analysts at Argonaut are forecasting net profit to increase to $7.3 million in fiscal 2018, representing earnings per share of 10.1 cents which places the company on a single digit forward PE multiple. It should be noted that broker projections and price targets are only estimates and may not be met. Those considering this stock should seek independent financial advice. It is worth noting that the extensive property portfolio owned by the company is valued at $1.18 per share. Factoring this into the equation — along with CLX’s strong 2017 financial performance, the company’s leverage to the uptick in parcel delivery volumes, and full-year contributions from acquisitions and expansion activities — it would appear that analysts at Argonaut are not far off the mark. They gave a valuation of $1.50 per share, implying a premium of circa 50 per cent to the company’s current trading range.